"The Mexican Lutheran Church has affirmed a commitment to women in ministry with its first-ever ordination of female pastors. The three women will serve in congregations of the LWF member church in Mexico City. Rev. Dr Elaine Neuenfeldt, LWF women's desk secretary, called the ordinations an "important sign" that will further reflection within the Lutheran communion on this issue. The LWF endorses women in ministry, and celebrates public witness of ordained women as both an expression and a gift of women’s leadership." this, in the face of a world, where millions go to bed hungry every night. Men and women and children suffer from malnutrition—wars are fought over the right to eat—the need to eat. There are those who question whether the earth can feed all of its people, yet in this country, subsidies are paid out every year to farmers to keep fields lying fallow so as to regulate the price of grain. Yet, we hear stories about the bread of life and that we are somehow suppose to feed the hungry. This country is called the bread basket of the world. How do we reconcile that with starvation around the globe? In our first reading from 2 Kings and in our Gospel reading from John we see like situations. There apparently is not enough food to go around. Then miraculously—something happens and there is not only enough food, but food to spare. It seems that the miracle in both cases comes about through the hands of mere mortals—in their willingness to be instruments for the divine—in their ability to believe in something bigger than they could see or imagine. In both cases, someone steps forward with some loaves—some fish—not enough but a start. I believe it is significant that the prophet, Elisha and the prophet, Jesus don’t just miraculously bring food out of nothing but that in each case, bring food from the gifts of the people present. A small gift given in faith, with love has the power to grow and be not only enough, but be a gift beyond the immediate need. There is always the chance, when we love unselfishly, for great things to happen. We should not underestimate that power. On this past Tuesday, I had the opportunity to give an hour of my time to a children’s summer camp located at the Maplewood Center here in Winona. The camp was sponsored by Winona Health. The week was devoted to giving underprivileged children opportunities to experience healthy living—learning how to eat in a healthy way, how to be with others in society—how to enjoy many wholesome activities—how to simply have good fun. I took the lesson to the next step and suggested that the gift of creation to each of us, including our own lives was not intended for just us to enjoy—but the greater gift perhaps—the next gift, was for us to share what we have received—to do our part to extend the love. Is it that we have to do big things?—no, it can be as simple as Anna Quindlen says in her little book on life—“show up, listen and try to laugh.” As we spoke about, the last couple of weeks here—we can do extraordinary things through our ordinary lives. A friend reminded me of that just recently. A story came across my desk just the other day that illustrates this very well—an example of someone going out of their way a bit, doing some extraordinary kindness, that in the whole scope of the world doesn’t change much perhaps, but for one little girl and her family, made a great difference and truly showed them the face of their loving God. It seems that a 14 year-old dog, named Abbey of a particular family, died. Four year old Meredith was crying the next day as she grieved for the family pet. She asked her Mom if they could write a letter to God so that when Abbey got to heaven, God would know who she was. Of course Mom said yes and this is what Meredith dictated to her Mom. Will you please take care of my dog? She died yesterday and is with you in heaven. I miss her very much. I am happy you let me have her as my dog even though she got sick. I hope you will play with her. She likes to play with balls and to swim. I am sending a picture of her so that when you see her, you will know that she is my dog. I really miss her. They placed the letter in an envelope addressed to God/Heaven with their return address and Meredith affixed several stamps to it saying that it would take a lot to get it all the way to heaven and then they dropped it in the post box. A few days later Meredith asked if God had gotten the letter and her Mom said she thought so. Abbey arrived safely in heaven. Having the picture was a big help. I recognized her right away. Abbey isn’t sick anymore. Her spirit is here with me just like it stays in your heart. Abbey loved being your dog. Since we don’t need our bodies in heaven, I don’t have any pockets to keep your picture in, so I am sending it back to you in this little book for you to keep and have something to remember Abbey by—thank you for the beautiful letter and thank your mother for helping you write it and sending it to me—what a wonderful mother you have. I picked her especially for you. I send my blessings every day and remember that I love you very much. By the way, I’m easy to find, I am wherever there is love. We began this reflection talking about the need to share bread with the hungry—an ever present need when the known fact is that so many go to bed hungry every night—so many die every day for lack of food. We are like the apostles—incredulous before the sheer scope of the situation—“what good is my little gift—my small offering against so many?” But we must not forget the stories of scripture today—God can and does perform miracles despite our lack of religious imagination. We simply have to show up and do our part—like the person in the dead letter office in the life of Meredith. That simple story is a case in point for the fact that people don’t only need bread for their physical bodies, but for their spirits—the food of heart and soul is needed as much as the food for our physical bodies. Again, we may think that we are not able to do much in any given situation, but don’t underestimate the power—the miracle that can happen through each of us if we are willing to show up and be instruments on this earth for our loving God. Each time we gather for Eucharist and we take the bread and wine into our bodies—it becomes then Jesus’ body and blood for the world through the actions of our lives. This is a wonderful power that Jesus gives us! As Paul says today in his letter to the Ephesians— “As children of the one God who is over all and works through all; we will be agents of God’s good will.” And do we have a choice about whether to do these good works? No, we really don’t—if we say we are Christian and follow the prophet from Nazareth, we can only respond to the love given by giving back. We are all, each of us diminished when anyone goes hungry in any way—be it in body, mind or spirit. Let us pray today that each day we would have the strength to show up and do our part. 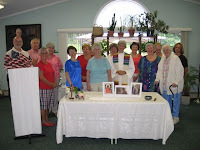 Roman Catholic Womanpriest Mary Ann Schoettly gathers with local community to celebrate a liturgy in honor of St. Mary Magdala in New Jersey. New book by Ophelia Benson: Does God Hate Women? The co-author of the new book Does God Hate Women?